Very big outfit in container ship transportation I used to haul the loads from Boston to points all over the Northeast. Hundreds of trailers a day left the port. 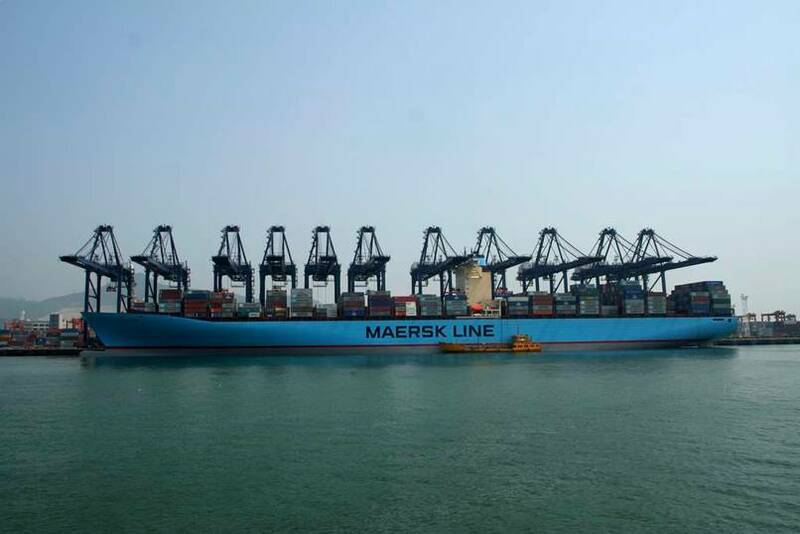 What a ship….no wonder ‘Made in China ‘ is displacing North American made goods big time. This monster transports goods across the Pacific in just 5 days!! Another two will soon be commissioned. 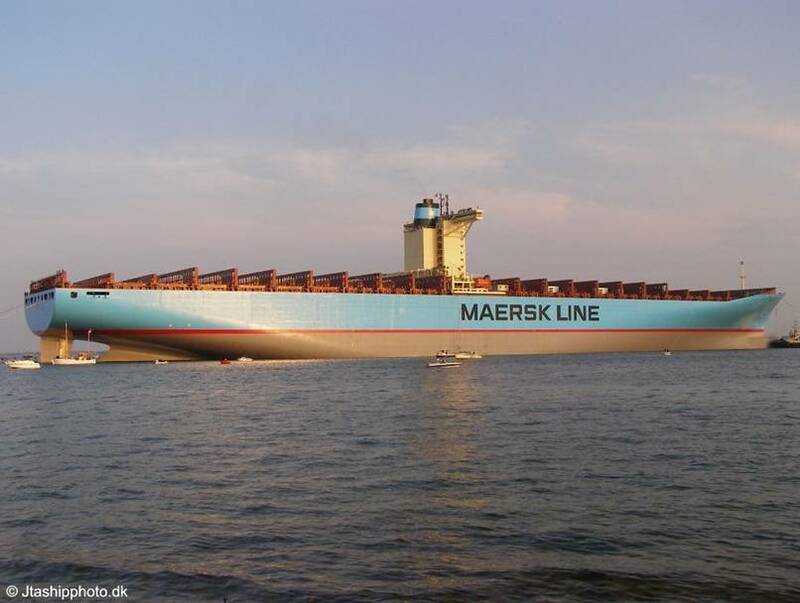 These ships were commissioned by Wal-Mart to get their imported goods from China ….. They hold an incredible 15,000 containers and have a 207 foot deck beam!! The full crew is just 13 people on a ship longer than a US Aircraft Carrier which has a crew of 5,000. 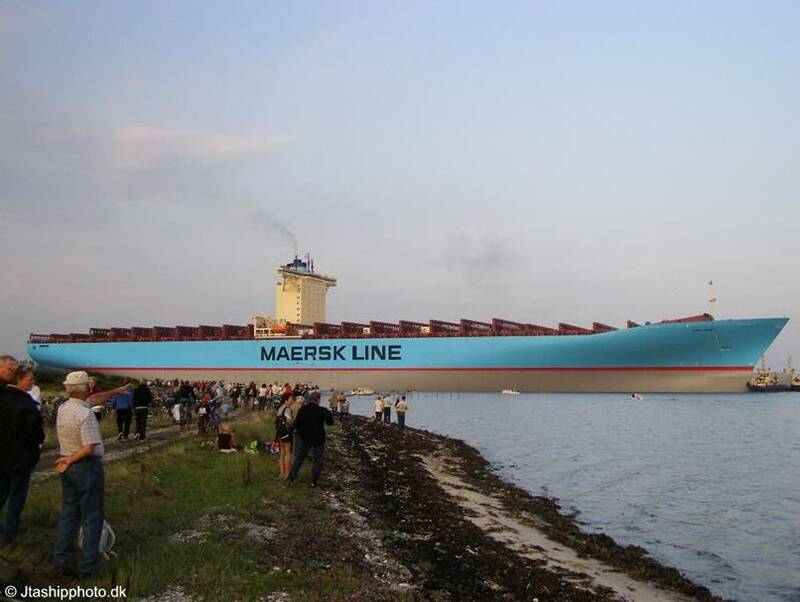 With its 207′ beam it is too big to fit through the Panama or Suez Canals ………..
We went for a ride up into Maine yesterday. The day started rainy and socked in with think fog here in New England yesterday, while so many suffered in horrible cold and snowy conditions. We will take what we can left of this year, before we too must huddle together and keep ourselves warm. A few years ago I took a class with Mom on fusing glass with a wonderful teacher who has since passed away. She had told us about a woman in Maine who taught wire wrapping, so we could make our pieces we did, look even nicer and go from glass into jewelry pieces. Well that winter we went out to Arizona to hunt for Gold and I met a woman there who took the time to show me a simple wrap that as I got more proficient I could add my own flair to. Well yesterday the woman in Maine, who I follow through Facebook, had an Open House for her jewelry pieces. So that was my plan for the day, a nice quiet ride up into Maine to meet her in person and see if I could find something pretty for a gift as well as to support another starving artist. The ride was quiet but boyfriend and pup decided to join me as I always find the neatest things when I take the time to venture out from the house. With winter on our heels I knew days upon days of me being inside would soon arrive. So I packed the dog’s fresh water, my camera bag and off we went. I made it to her place with no trouble and told them I would be awhile and for them to go find some fun without me. See what I mean. Happy dog! Now look what happens when she has to wait for me to stop taking pretty photos of the beach and sea. You would think I had put her in the down command but actually she really has the need for just one COME. She is too smart to do anything DUMB. Yes I am blessed and very proud of my pup. She is such a good girl. A elderly couple was out for a walk on the beach and asked if they could give here a dog bone. I never allow it but they were nice and JT sat pretty and stole their hearts in an instant, she even took the cookie and ATE IT, she never does. She must have worked up an appetite from all that running on the beach. She was one happy dog, I swear I caught a smile or two yesterday. She does love the beach but hurts too bad in her joints if we play for hours so the half hour worked out perfect. We took the long way home, back roads all the way back to NH. I have really seen that section of highway enough in a rig. As we made our way along the coastline the towns had decked the streets with holiday lights and wreaths, it was beginning to look a lot like Christmas, well all except for the snow that was gladly missing. I had timed the day near perfect. Soon it would be dark enough to see some lights and I headed for the most famous Maine Lighthouse to see them. It was just a tad too light so I let JT out where she made new friends while I waited with not one but two cameras to catch some action beside the Atlantic. I took too many photos, wait could that happen ? Let me show you a couple to end this post. I even added some to my online gallery for Holiday Cards! Who doesn’t love the sea and these gorgeous lighthouses that keep the sailors safe. Having just been Earth Day it is a good time to be reminded to LOVE OUR PLANET EARTH oh and EACH OTHER!!!!!! Beautiful towns covered by swat teams, one of the bombers is now dead but so is a MIT school officer. Makes you wonder why so many flee from their homelands and flock here. It is not the America I knew as a little girl and it is very sad. Praying for the people just 50 miles from me and America as well. All trains, buses shut down. Businesses now closed people told to stay in their basements pray for us that this will end without another life being taken. UPDATE the WHOLE CITY OF BOSTON IS SHUT DOWN! No Taxis, autos, trucks everyone to stay in their homes and wait till he is caught. Woman with infant now in police car being questioned girlfriend or sister. FRISCO — With Arctic ice on the brink of near-total meltdown, super storms brewing in the oceans and after a summer of heatwaves and drought, about 17,000 delegates start meeting this week in Doha, Qatar to try and make some progress on the UN’s annual climate talks. The backdrop for this year’s talks are continued dire warnings from scientists, who are saying that, if we can’t cap emissions by 2020, the world could be headed for runaway warming, with temperatures not seen on Earth for millions of years and almost unimaginable consequences for all life on Earth. One of my favorite places to stop at in Maine is Nubble. taken here and these above are mine from just one day there. I spend anywhere from a few minuets to an hour here. Summer, winter or fall it doesn’t matter. I have always been drawn to this special place. maybe pull out their camera and snap a photo of this glorious spot, along the rocky shoreline. see it in person. OK take a photo too and check out the benches . Assorted feathered visitors who stay and have their young, in our backyard. I think this is a young Coopers Hawk and he swooped in to try to grab a little Juncos or Red Squirrel , what a Naughty Bird, no I know he was hungry but stayed with me for a long time while I took photo after photo of him, while it was snowing out. Little Juncos thankful it was not lunch! They all hung out inside my rose bushes, beside me and my camera. That naughty hawk scared them bad enough that I made them feel safe! I love that all of these birds like our place enough to call it home. I whistle for these males and in they come for a meal, love being one with nature. They look pretty happy here, now remember we have a Cool Cat and JT the border Collie. Love these tiny, full of life, amazing flyers! Such cool birds to have all around you in the yard. Saddest part of fall is when they leave for South America. My CB Handle was Hummingbird, lol and only tattoo is a life-size one. So beautiful just sitting and waiting for the feeder to be less busy. I have the flowers for their beauty but in the end they all go to the BIRDS! Blue Jays love our day old bread! We have every variety of woodpecker and they all LOVE SUET! Then again that is what the Black Bear wanted to rip the feeder down for. Never saw this one before unless it looks different in the winter. Morning Dove hangs out waiting for their turn too. I worried about this Blue Jay, as his head feathers looked horrible . Well I have taken up so much of your time with the birds who visit our yard, here in NH,USA I will let you go but thanks again for stopping by and letting me know what you think.